My birthday was relaxing, which is all I ever really hope for every year. I'm not a fan of too much excitement; the most exciting thing Shawn and I did was visit a new place in Pennsylvania (which is something we've been trying to do once a month or so). The day didn't really go as planned, but for as long as Shawn and I have known each other our plans never ever really seem to go as planned, so it was kind of expected. I worked the morning of my birthday (adult life, sigh) but was home by 11am. 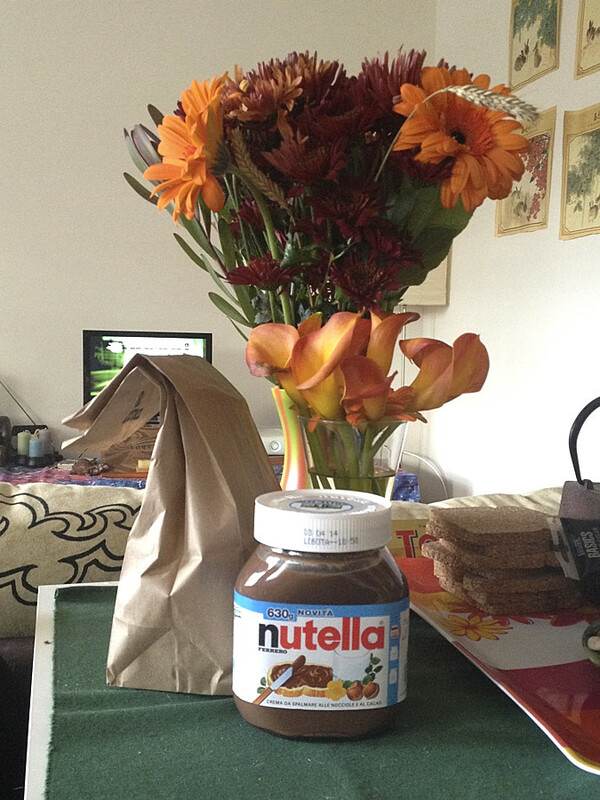 I came home to flowers, Nutella (Made in Italy, not America! It's actually in a glass jar, not plastic! ), and two sugared donuts from the Amish market nearby. Shawn clearly knows the way to my heart! After noon we drove out to Frecon Farms hoping to pick some apples and pumpkins, but I completely glossed over the fact that pick-your-own is only on the weekends... so instead we chatted with the farm shopkeeper and brought home a bounty of things they had already picked. 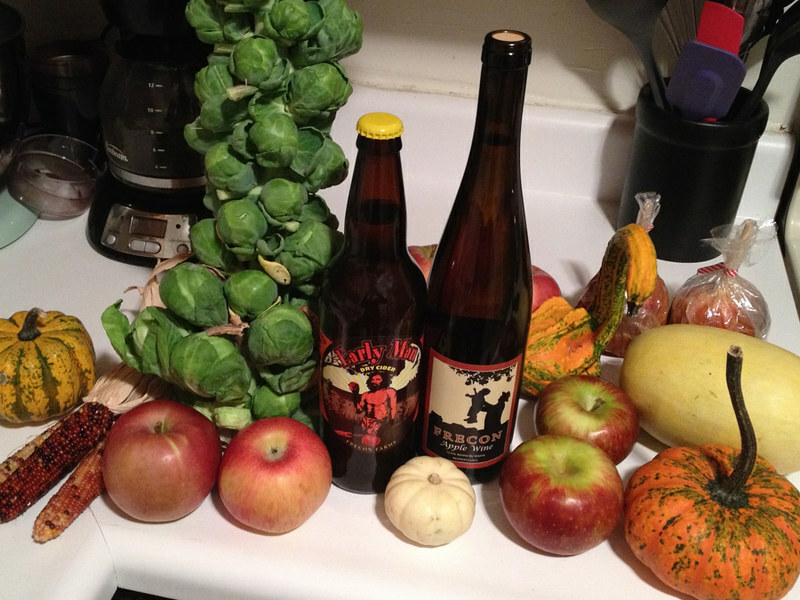 Hard cider, apple wine, a few different types of apples, small pumpkins, gourds, spaghetti squash, and a giant stalk of brussels sprouts! He also gave us two caramel apples for free. 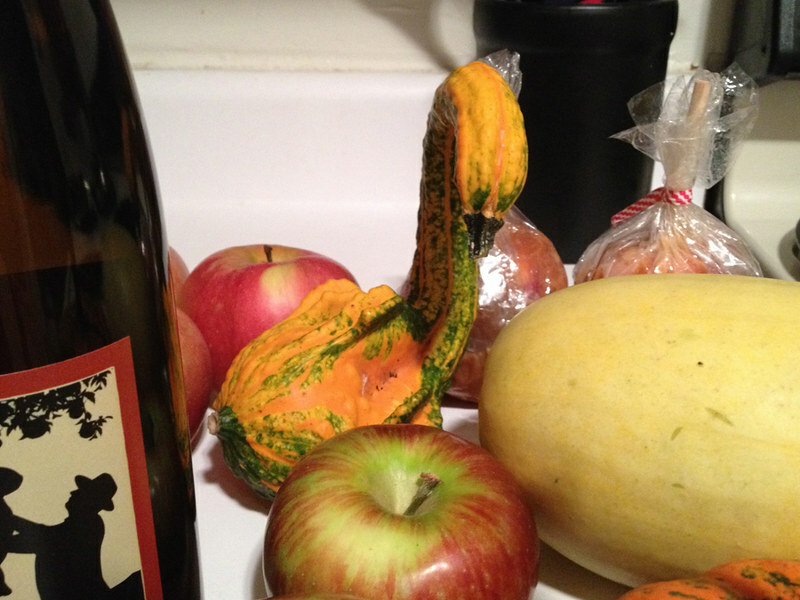 I picked out this gourd because it reminded me of a swan. The farm shopkeeper told us about a brew pub nearby called "The Other Farm" (actually owned by the owners of Frecon Farms!) so we went to check it out... only to find out that they closed at 1:30pm during the week. Second plan thwarted for the day! 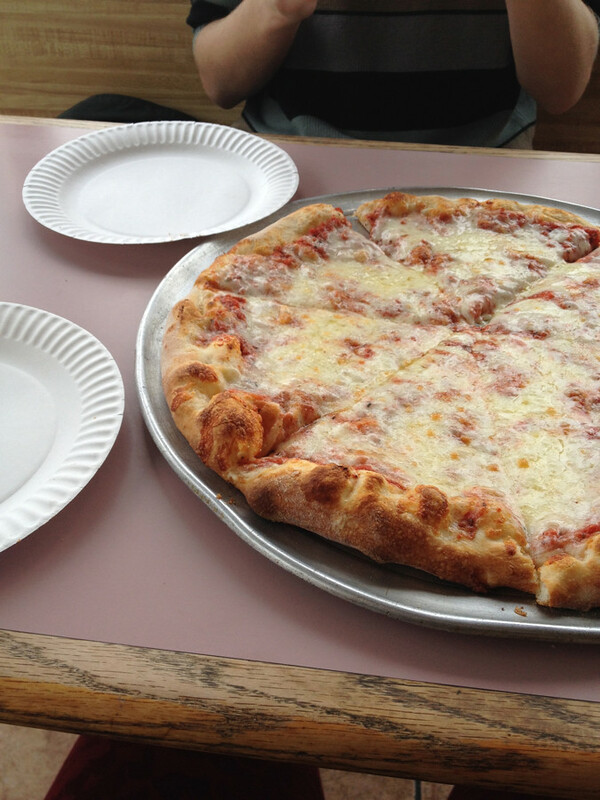 So we got pizza at a local pizzeria instead. The dough was awesome and sooooo fresh. It also felt like we were the only people in town that day. Gratuitous Lloyd photo! 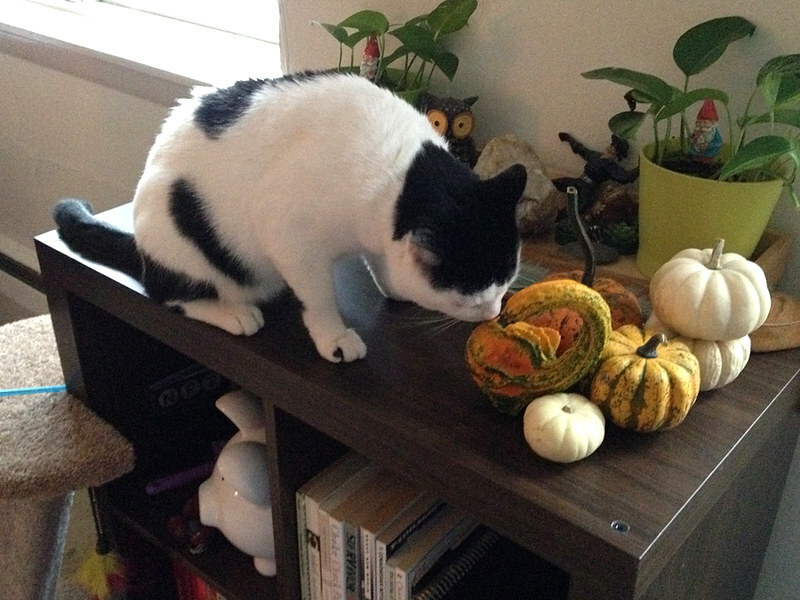 He was very curious about the variety of gourds we brought home that day. Probably because they were taking up his napping place. We spent the rest of the day watching new episodes of How I Met Your Mother until I fell asleep on the couch. I had gotten up at 4am for work and despite taking a quick nap before venturing out, it still ended up being an early night for me. 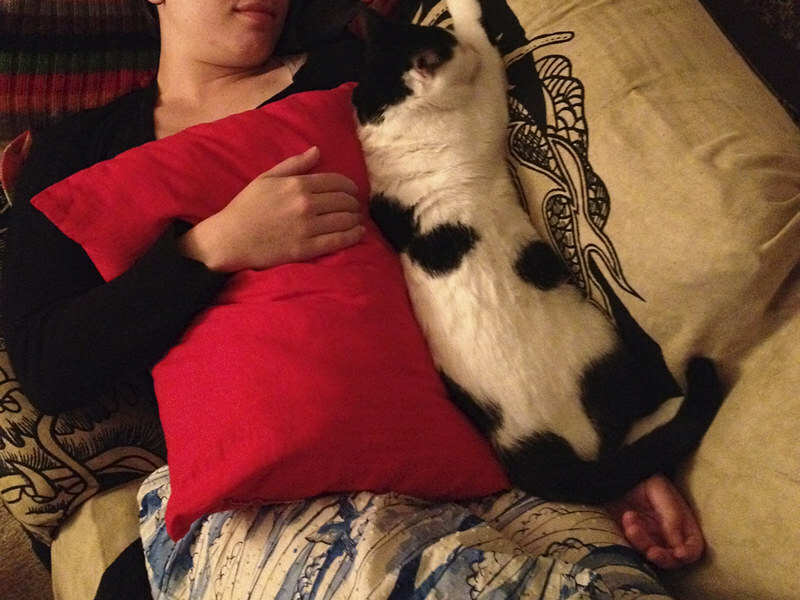 Shawn snapped this photo of Lloyd and I napping together. All in all, an awesome birthday. I spent most of it sleeping... but I wouldn't have it any other way. Getting older is tiring, man. Don't let anyone tell you otherwise! Also, my parents got me these fun things from Anthropologie when I saw them on Saturday, along with an Anthro gift card. 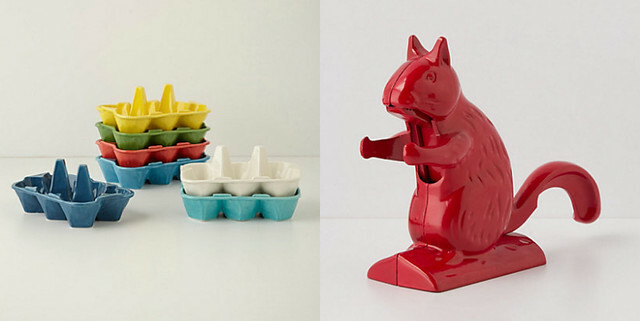 (Yes, that's a squirrel nutcracker! And an egg holder for when I'm baking, so the eggs don't roll around on the counter.) I'm still trying to figure out what I want to use the gift card for... I think I know what I want, but I don't want to say until I'm sure. I always have a hard time with gift cards because I want to get something meaningful with them. I could easily buy a few items of clothing, but I'd much rather buy something that will remind me that my parents got it for me. I guess I'm sentimental! Glad our shared birthday was good for you! I spent all day at work, and by the time I got home I had some rough news and was just happy to get dinner at Thai Kitchen. We should definitely share a belated birthday repast soon, though. Hopefully things will get a bit easier for me to manage now that I have the new place! that last picture of lloyd. i just can't. i want one so bad. He is too cute. Cats are awesome; you totally should. I'm so sad you guys missed Pickfest! We went to the Other Farm too - I was sad they didn't have cheese before 6pm. Anyhow - how did you like the AngryMAn? That was by far the best. You two should come out to Lancaster! We can take you to some of the cute places downtown. I've got a list of places myself to visit - like the Shoe House and Columcile.